A campaign is not complete without yard signs. 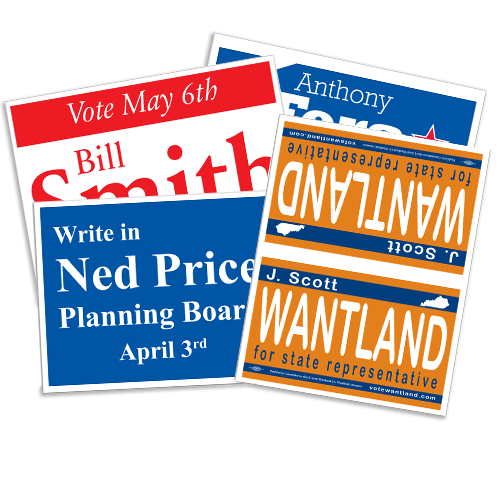 Our yard signs are made from quality materials giving you a superior product. We can print in 1, 2,3, or full color. With our Union Label you can keep your campaign union friendly. Our signs come with stakes so you can easily post them on your lawn. We print our signs on 24# poly coated card stock, so your signs will hold up well in in climate weather.If you are stuck on an idea for your sign we also offer design services to help promote your cause! Variety of paper styles materials, and weights; including poly coated, coroplast, and poly bag. Typesetting and design services available. 1, 2 or Full color printing on 1 or 2 sides. Get your name and business out there!